It’s early on Sunday morning August 24, 2014. I’m at the office. I just printed out a fresh copy of my sermon. In a few minutes, I’ll make the 1/4 mile walk from our church office building, through the Lawnton neighborhood, to our church building. There, I’ll have an hour or so to work through the sermon material before the worship team arrives for their practice. When I get there, the building will be quiet and dark. I like being in church before everyone else. It gives time to think and time to pray. Often, one of the things I pray before a sermon comes from a resolution I made years ago. But before I tell you the prayer and the resolution, let me tell you the backstory. 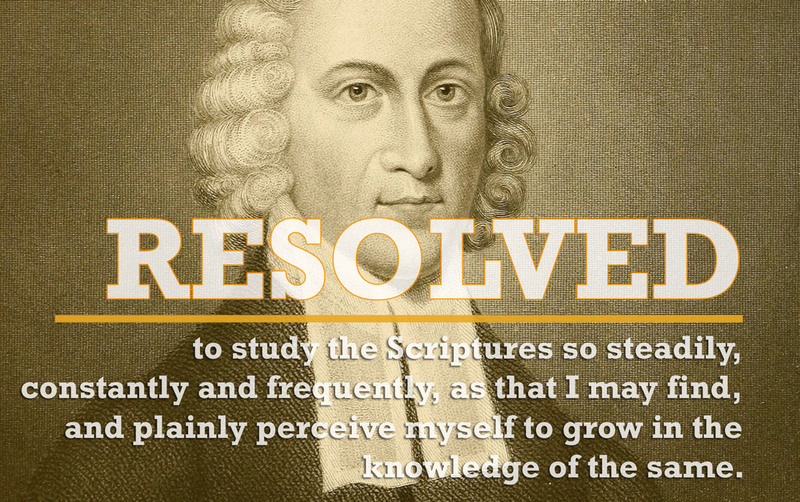 Eleven years ago, I stumbled upon “The Resolutions of Jonathan Edwards,” the 18th century New England pastor. He wrote the resolutions as a young man. I liken Edwards’ resolutions to your typical New Year’s Resolutions, except he injected his resolutions with steroids. See what I mean. New Year’s Resolutions on HGH—and, of course, the Spirit of God. Over a decade ago, when I read Edwards’ resolutions, I felt challenged to write my own. By now, I have a few of them but only one related to preaching. 1. Resolved, whenever I should preach, that the prayer of my heart, and the subsequent fruit of my lips would be this: that God’s Word would parade in glory and ransom hearts to holy worship. I love the imagery of a parade—the Word of God in a glorious victory march, captivating the hearts and minds of God’s people, and moving them to holy, Christ-exalting thoughts, words, and deeds of worship. 4. Resolved, not to let my heart become so frazzled that it cannot feel poetry. 7. Resolved, never to multi-task while eating dark chocolate or drinking pumpkin coffee. For now, back to the task at hand: prayer—because in 4 hours, it will be time to preach. At our church this morning we will finish a series through the Book of Haggai—a governor named Zerubbabel, a signet ring, and God overthrowing all of his enemies. Exciting. Lord, may the prayer of my heart, and the subsequent fruit of my lips, be your Word parading in glory and ransoming hearts to holy worship.